Nordion (Canada) Inc. (Nordion) is licensed by the Canadian Nuclear Safety Commission (CNSC) to operate a nuclear substance processing facility, located in Ottawa, Ontario. At this facility, Nordion processes unsealed radioisotopes for health and life sciences applications, and manufactures sealed radiation sources for industrial applications. Nordion has a comprehensive environmental protection program to monitor and control nuclear and hazardous substances released from the site, determine concentrations in the environment, and assess exposure to the public. The Independent Environmental Monitoring Program (IEMP) results for 2016 and 2018 confirm that the public, Indigenous communities and the environment in the vicinity of Nordion are protected and that there are no expected health or environmental impacts. 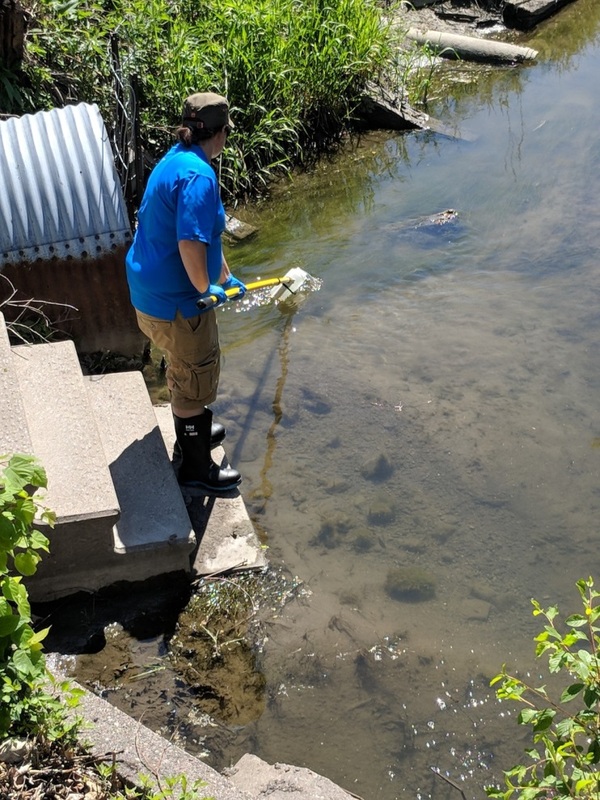 CNSC staff collecting water samples near Nordion in 2018. Under the Nuclear Safety and Control Act (NSCA), licensees of nuclear facilities are required to implement an environmental monitoring program to demonstrate that the public, Indigenous communities and the environment are protected from emissions related to the facility's nuclear activities. The results of these monitoring programs are submitted to the CNSC to ensure compliance with applicable guidelines and limits, as set out in regulations that oversee Canada's nuclear industry. The CNSC has implemented its IEMP to verify that the public, Indigenous communities and the environment around licensed nuclear facilities are protected. It is separate from, but complementary to, the CNSC's ongoing compliance verification program. The IEMP involves taking samples from public areas around the facilities, and measuring and analyzing the amount of radioactive and hazardous substances in those samples. CNSC staff collect the samples and send them to the CNSC's state-of-the-art laboratory for testing and analysis. The area outside of the Nordion facility site perimeter was sampled in 2016 and 2018. The 2016 and 2018 IEMP sampling plans for Nordion focused on radioactive substances. A site-specific sampling plan was developed based on the licensee's approved environmental monitoring program and the CNSC's regulatory experience with the site. In June 2016 and May 2018, CNSC staff collected air, soil, sediment and water samples in publicly accessible areas outside the Nordion facility perimeter. The levels of radioactivity measured in air, soil, sediment and water were below available guidelines. The IEMP results indicate that the public, Indigenous communities and the environment in the vicinity of the Nordion facility are protected and that there are no expected health impacts. These results are consistent with the results submitted by Nordion, demonstrating that the licensee's environmental protection program protects the health and safety of people and the environment. To obtain the full technical IEMP reports, contact us at cnsc.information.ccsn@canada.ca or call 613-995-5894 or 1-800-668-5284 (in Canada). Please provide the name of the facility and the report year.